or did I sleep at all? . . .
nothing to reveal my wondering gaze. Neutral being the safest gear for my survival. . . Unlike a bad dream, it doesn't come only when I'm sleeping, it doesn't go away when daylight comes, and even when my mind is occupied with hundreds of other thoughts and I'm busy with the "stuff" of living, working, and trying to care for my family, it lurks about and, without warning, it attacks, disrupting my cognitive and physical functioning, oftentimes bringing everything to a sudden screeching halt. The problems are real, the pain is real, the symptoms are real...even if you can't see them. Unlike a common cold or minor injury, it doesn't happen and then get all better and go away. The nerve pain that accompanies an attack is excruciating and unlike any other type of pain. If you've ever had a bad toothache, just try to imagine that type of pain occurring in any other part of your body. It can affect any body part or function at any time for any length of time. The numbness, tingling, and weakness that often occur can mimic signs of a stroke and can be very frightening and debilitating. I'm thankful that, at least for now, I have the relapsing-remitting type, where the MonSter attacks and one or more areas of cognitive and/or pyhsical functioning is affected for a period of time, then gradually resolves, although often not completely, so that I'm left with some residual pain or loss of function. Some of the symptoms I've had include vision problems and eye pain, vertigo and imbalance, difficulty walking, confusion, disorientation, difficulty processing information, slowed thinking, difficulty with speech, memory loss, numbness/tingling/weakness, burning sensations, spasms, reduced fine motor skills such as writing, unexplainable indescribable fatigue that can strike and suddenly render me immobile, pain - including what I describe as extreme "lightning bolt" type pain that takes my breath away and can make me collapse onto the floor. Please understand, although altering lifestyle and making some changes can help, these cannot cure MS. Rest is not a cure. Less stress is not a cure. More vitamins or supplements is not a cure. Better weather is not a cure. Currently there is no cure. There are several treatments being used that seem to slow down the progression of the disease and/or reduce the severity of the attacks. In my opinion, most of the treatments that are being used are experimental at best. 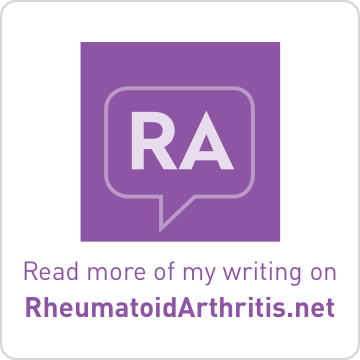 It is my hope that by writing about my own personal experiences, readers will have a better understanding of MS, and some might also better understand me as a person and perhaps have just a little more tolerance and compassion. I would not wish this MonSter on anyone, but MS is no respecter of persons; it could choose you or one of your loved ones next. Most folks in the "civilized" world are familiar with the objects in the above photograph. And most people would not find the objects the least bit intimidating or frightening. I've never had a problem with them...until yesterday. You see, yesterday I was feeling a little "off" from the time I awoke and got out of bed. I was a little unsteady on my feet, and I noticed I was having some difficulty keeping my thoughts together and I was having trouble making even the smallest decisions. After taking much longer than usual to make my bed, put a load of laundry in the washer, eat breakfast, and wash dishes, I knew I needed to get a shower and get dressed. But I was a little leery of trying to stand long enough to finish my shower, so I decided it might be best if I just took a bath instead. Well, everything was going along okay and it actually felt good to soak for a few minutes after bathing. The problem arose when I decided it was time for me to get out of the tub. I sat and stared in front of me at those shiny silvery objects that are shown in the photograph....it seemed like it was for an hour, although it was perhaps only four or five minutes. As I sat and stared, I became a little frightened as well as frustrated...because I could not remember what I needed to do in order to drain the water from the tub. No, I haven't suffered a traumatic brain injury...no, I don't have Alzheimer's disease (as far as I know)...no, I didn't have a stroke, etc. 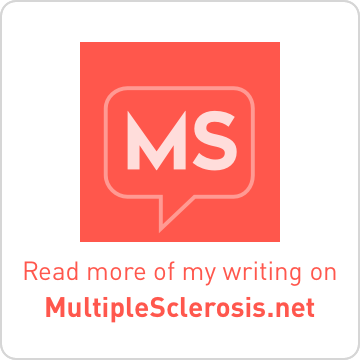 I was having an acute attack of my brain "short-circuiting", something that happens to me fairly frequently as a result of having MS (multiple sclerosis). These particular episodes usually don't last very long, but I do have some permanent long-term as well as some short-term memory loss. The attacks can occur at any time, but tend to be more frequent if I am fatigued, emotionally, or mentally stressed, too hot, too cold, or have any type of illness going on. This is just one of the many symptoms I have with this cursed disease. Why am I telling you this? Because I want to help you understand what is happening to me...why I am constantly keeping lists or a journal, why I sometimes seem to be staring blankly into space, why it sometimes takes me longer than you think it should to answer a question or complete a simple task, why I say "no" or "not now", or "I can't" a lot more often than I used to. On the outside I may look "fine", but on the inside I am often a "tangled mess of misfirings and disconnected electrical impulses". So, if you can accept me as I am with all the changes that are now happening and doubtless will continue to take place (unless there is a miraculous cure), I welcome you into my life. If not...if it frightens you or it's too much for you to bother with or handle...then you will probably become suddenly silent, quickly disappear, walk out, or just slowly back away as many others have already done. Either way, I thank you for listening to me. God knows how many wounded stories. Anger, frustration, sadness, grief, expressed through sarcasm, I admit this is where I am sometimes, sometimes lately. Sometimes it gets a little crowded, a little ugly and uncomfortable in my mind. I’m aware that this tumult is happening, arising from fear, from disappointment. I recognize these emotions for what they are and see what is inside, what is outside, what is changing, oh everything is always changing and that is a comfort. But still, I get lost in myself sometimes. I momentarily forget that it isn’t all about me, well of course not. Life is about US, and so much more. I know this, I do, and still some days, some days lately, I lose my way; tense, snarky, suffocating thoughts spin round and round and choke me, filling my throat with words I should NOT say, come out garbled anyway, until I finally remember; just exhale and listen. I hear my own agitation ricochet, a pinball ringing bells, lighting lights, through a maze of words, words, words, so much noise in this dark cave my mind can become, points I score are pointless, they only create more tension so that I must release the spring-loaded thoughts; just exhale. I inhale fully and then exhale again, a deep sigh of forgiveness. Compassion, love gratitude, rush in with a tide of tears. I’m only human. And only human is enough. It is all I know how to be. It is all that I am, that we are. And yes this is about US, a story told from my perspective on a particular day, but as I said, it isn’t all about me, not really; this is a story about life, it is about all of us, and so much more. First timer at the Social Security office; my mind chasing its own tail, looking at all the other people in the waiting area, anger flashed “What am I doing HERE?” My husband went up and took a ticket. We sat listening to the numbers being called, a grayed—where is the hand sanitizer, I know it is in my purse somewhere—kind of space. The ticket made me think “bingo hall,” not that I’ve ever been in one, but I’d never been in a Social Security office either. Three rows of chairs lined up, linked together, no tables —was our number "A34" lucky??? And a large silent TV with S.S. info-mercials, alternating English/Spanish subtitles, a continuous "easy-listening" garageband music loop that I was certain was playing subliminal messages ("get out while you still can") or would put me in a coma from utter repetitive boredom ('irritating-listening" for me). All the while denial, that sleeping dragon stirred —“I don't belong here with these three pony tailed, war vets, these two mothers with runny nosed toddlers wrapped around their plump legginged legs —round eyed cuties playing peek-a-boo with the strange looking lady with the freakish uncontrollable random head shake in the fold up wheelchair (could easily be mistaken for an oversized umbrella stroller), the old man who looks so tired and doesn't seem to understand what the annoyed woman in the cut-out window keeps repeating to him (repetition a common theme in the room), the twenty-something kid who couldn’t possibly have showered today or washed his jeans in at least a month if ever. It wasn't that crowded —and then one little girl forgot to be shy and started talking to her Mamma about her cell phone (her mother's, but she was pretending to be grown-up), and I heard my toddler voice. My MS impaired toddler voice thrown ventriloquist style escaping through her tiny rosebud lips. Maybe she was two and a half, three tops; she was easier to understand than me, the lady with the freakish uncontrollable random head shake in the fold up wheelchair (could easily be mistaken for an oversized umbrella stroller) —and tears leaked out of my eyes, slid down my face, rained on my jeans, softening them so seeds of compassion could embed themselves in my soul-soil; tender blossoms of love at the ready, just below the surface. I am every single one of these individuals. They are me; we are ONE. 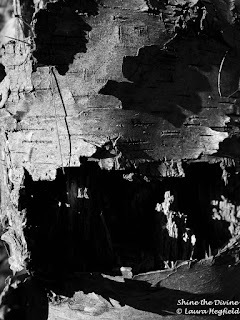 We are all living life, decaying hollowed hallowed tree trunk people, silvered, surviving through challenges we didn't expect. We are humans who need help. I am a human who needs help. I worked for as long as I could, except when my kids were really small. I can't any more. Not outside our home. I do what I can when my voice allows over the phone, I'm a good listener. I create meditation podcasts that I offer for free, because it is a struggle for all of us living with chronic illness first to be able to get to a class, second to be able to afford it, and if someone has a little extra to donate, that's great, I appreciate it but don't really expect it. I paid into the system, pray into heaven right here, the Holy Essence residing in my heart. With our first child about to go to college in the fall, and the high cost of medical care, our family, needs income from me too. We are a multi-illness health insurance company’s worst nightmare family, and arch enemies apparently considering all the headachy “NO we still don’t have any other health insurance than yours. NO our 15 year old daughter doesn’t have her own top secret health insurance coverage beyond what we her parents provide through your company. What do you mean you will cover the injectable medication but not the syringe and we need a separate prescription for the syringe that you won’t pay for? How exactly am I supposed to give this medication to my wife that she was supposed to have last weekend but you didn’t send it until now-sans freakin’ syringe?? ?” phone calls. These are just a few highlights from this past week’s health insurance shenanigans. I'm sure this is familiar to many of you too. I hope that my Social Security Disability Insurance application won't be rejected. And I understand that it might be. That happens to a lot of SSDI applicants. People I know, and they have to drop their dignity again, go down to the dingy office in their city or town again, and sometimes a third time again; months and months and months of waiting to be judged "sick enough" and deserving of the money that they paid into this failing system. It has been three years since my official diagnosis; four years since I was last able to actually go to work. So for all of my family members and friends who have been telling me to go do this thing (“its so easy, they’ll help you, I’ll drive you, you are entitled”) I did it. I pulled together the courage, swallowed my pride and with my husband pushing my chariot rolled through the damn door. Ironically one of the blue electric handicap accessibility door buttons didn't work, so one of the vets opened the last door into the building for us. Was it a sign?? No, this happens all the time. You see, I wanted to believe that I would get better, be able to drive, work again at a real job. For the past three years I really, really wanted to believe that, but remission for me is like the tree bark in the photo. Mostly I'm still standing, I even look good some days, but there are missing pieces in the myelin that is supposed to protect my nerves and carry messages from brain to muscles and vital organs, and I'm not going to be how I was. I think I lived through THOSE remission years already, and now there is too much damage to repair after new lesions form or old ones get bigger. So, Ok, I get it. It isn't going to happen. That part of my life is over. Done. Gone. This is how it is today. Tomorrow will be different. And so it goes. I left heart broken with grief swirled into twisted relief. Not bitter, not sweet, metallic; perhaps that’s the taste of it? I don’t know how long we’ll wait, if I’m sick enough to qualify for benefits. What strange words to write in the same sentence, “sick enough" - "qualify" - "benefits.” But the first part of the deed is done. We went out for Indian food at my favorite buffet to "celebrate" this big step toward fuller acceptance of our shared life. We were hungry and it is on the way home. The waitress gave me her chai recipe (I didn’t know until I complimented her on how much I love it, drinking my second cup, that she is the one who makes it); hers is the best in town. If only I could walk downstairs, I'd make myself another cup. I think we have the ingredients. Chai in Hebrew means Life. I am ever so grateful for the beautiful souls surrounding me in that waiting room, softening my own soul-soil, planting seeds of love, grateful for the bogeyWOman who helped me release my fear through her kind demeanor (because that is what pride often is, fear hiding behind pretentiousness.) Here's to Chai, just as it is, Holy and torn through with gaping holes, difficult and suffused with kindness, imperfect and whole. This is our story. This concludes the 111st edition of the Carnival. The next Carnival of MS Bloggers will be hosted here on April 12, 2012. Please remember to submit a post (via email) from your blog of which you are particularly proud, or which you simply want to share, by noon on Tuesday, April 10, 2012. Many thanks, Lisa. You do make me feel like I am part of a community. Lisa, I am glad I found your post as your story is a very important story to tell while at the same time I am sad to read about your suffering. Since you are interested in the research side of MS to find the root cause, I was wondering if you had seen the following page that a team of researchers have posted. It is different than a lot of the research blaming the immune system alone for attacking myelin but instead notes that the cause may be from bad chemistries occurring in the gut that affect the entire vascular, microbial, immune, and neurological systems. 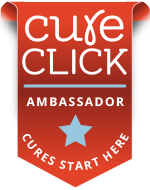 Take a look here http://nubiome.com/blog/cutting-edge-multiple-sclerosis-research/ . A problem with medical research so far is that each branch of medicine (neurology, immunology, cardiology, etc.) seems to be fairly compartmentalized into silos with little cross-communication. From these MS discoveries, it clearly shows that scientists need to look outside the central nervous system to find the root causes and therapies of the "incurable" neurological diseases. The lack of this activity is probably why these conditions have not yet been cured. However, these new announcements will surely accelerate new research and mainstream treatments for MS and I hope can have an impact on your situation. Olivia, I'm both sorry and happy that these stories touched you. Not having the diagnosis yet is truly frustrating. Not knowing what will happen in the future is frightening. Some attacks took a long time to improve for me even with steroids. Hang in there! BTW, I meant to comment on one of your posts written the night before you visited a new neuro. I literally laughed outloud...and laughed again as I read it outloud to someone who was wondering why I laughed so suddenly. Thank you for that! Thx for the link you posted on Twitter. I'm away of the majority of the theories discussed on that one page. Hopefully as more research is conducted, we may come closer to solving the causes of MS and its symptoms. BTW, the story above is not my own. The Carnival shares a variety of stories of throughout the MS blogging community. Lisa this Lisa is also glad I found you and the others,Olivia believe us when we all say we know the frustration,Lisa so glad people like you do so much for those of us here who suffer with the "demon",take care all.